America's biggest allies and trade partners are promising to fight back against US tariffs that threaten to spark a global trade war. The European Union, Canada and Mexico said Thursday that they will respond to new US tariffs on steel and aluminum with punitive measures targeting American products worth billions of dollars. Jean-Claude Juncker, president of the European Commission, said the bloc would move ahead with tariffs that are expected to affect roughly $7.5 billion worth of US exports. It will also lodge a case with the World Trade Organization (WTO). "The United States now leaves us with no choice but to proceed with a WTO dispute settlement case and with the imposition of additional duties on a number of imports from the United States," Juncker said in a statement. China is reportedly looking to line up other countries against the U.S. in a pending trade war after the White House took an unexpected move forward on tariffs a day earlier, the Wall Street Journal said Wednesday, citing Chinese officials. On Tuesday, the White House announced it would have a final list of $50 billion in imports that would be subject to 25 percent tariffs by June 15, and two weeks later would announce investment restrictions on Chinese acquisitions of U.S. technology. In response, China is reportedly looking to line up countries against the U.S., the Journal reported. The countries in question are mostly in Europe and Asia, where companies could benefit from China's plans to give foreign companies more open access to its markets. Canadian Prime Minister Justin Trudeau took aim at President Trump on Thursday over his implementation of steel and aluminum tariffs against Canada and other nations. At a press conference Thursday, the Canadian leader issued some of his strongest remarks against the Trump administration's trade policies to date. "Let me be clear: These tariffs are totally unacceptable," Trudeau said. "Canadians have served alongside Americans in two world wars and in Korea. From the beaches of Normandy to the mountains of Afghanistan, we have fought and died together." Noting that Canada purchases more U.S. steel than any other nation, Trudeau lambasted the Trump administration for initiating the tariffs under the guise of confronting a threat to national security. Tata Steel has urged the EU to take "swift and robust action" in response to a US decision to impose a 25% tariff on European steel. The US said the tariffs on imports from the EU, Mexico and Canada would start at midnight. This will impact directly on Port Talbot as about 10% of Tata Steel Europe's exports go to the US. Wales' First Minister Carwyn Jones called it "short-sighted" with wide-ranging implications for business. Liberty Steel's Welsh plants including Newport will not be affected, but it could hit parts of its UK operations. Almost 7,000 workers are employed by Tata in Wales, including about 4,000 in Port Talbot. The Trump administration announced Thursday it will be moving ahead with the tariffs on ally nations, despite those nations' urging that he not do so, and fears of retaliatory tariffs. On Thursday, Canadian Prime Minister Justin Trudeau went as far as to call the tariffs "illegal." Commerce Secretary Wilbur Ross said Thursday the U.S. will impose the 25 percent tariffs on steel imports, and 10 percent tariffs on aluminum imports, when a previous exemption expires at midnight. Mr. Trump originally proposed the tariffs in March, but deferred them as negotiations continued. China hit back at U.S. President Donald Trump’s plan to push ahead with tariffs on $50 billion of Chinese imports despite a recent truce in the trade fight, saying it damages America’s standing. “Every flip-flop in international relations simply depletes a country’s credibility,” Hua said. President Donald J. Trump has gotten angry and decided to take his toys and go home, unleashing tariffs Thursday on metals that will inevitably raise the price of cars. Mexico and the European Union announced retaliatory tariffs almost immediately. Before today, Trump’s tariffs on steel and aluminum—25 percent on the former, 10 percent on the latter—were mostly hypothetical, since after announcing the tariffs in March the Trump administration also gave exemptions for allies like Canada, Mexico, and the E.U. But those exemptions are now over and, according to The Washington Post, the tariffs will take effect at midnight. President Trump campaigned on going hard after China for ripping off the United States on trade. Yet a year and a half into his presidency, Trump has put more tariffs on longtime U.S. allies than he has on China, his supposed "bad guy" on trade. The Trump administration announced new tariffs Thursday on the European Union, Canada and Mexico. Almost all of the reaction has been negative. Many are calling it a political and economic mistake. America's allies are stunned, stocks slid on Wall Street as trade-war fears returned, and economists are warning that Americans will soon face higher prices on a wide variety of products. A slew of Republican lawmakers immediately trashed the move as bad for the economy and foreign relations. "Europe, Canada & Mexico aren't China. You don’t treat allies the same way you treat opponents. Blanket protectionism is a big part of why we had a Great Depression. 'Make America Great Again' shouldn’t mean 'Make America 1929 Again.' " tweeted Sen. Ben Sasse (R-Neb. ), joining an opposition that included many Republican officials and business groups. President Donald Trump has said that trade wars are easy to win. But winning will involve patience on the part of American consumers, importers, exporters and others. The flip side of the trade war is the squeeze that America’s strongest allies will impose. It is not clear how long the escalating tensions will play out. In the meantime, there are also many industries that will suffer collateral damage of higher tariffs that they may absorb by cutting jobs, pinching wages or taking other cost-cutting moves. Gas prices are rising already, so couple a trade war on top of that and you could see your grocery bill increasing upwards of 2x to 3x over for the same products! I expect an massive recession to come from this and that is what it will take to get rid of the republicans....Just like after the great depression or Bushs mess. The US Treasury Department has just announced the full implementation of steel and aluminium tariffs on imports from the EU as well as from fellow North American Free Trade Association (NAFTA) members Canada and Mexico. 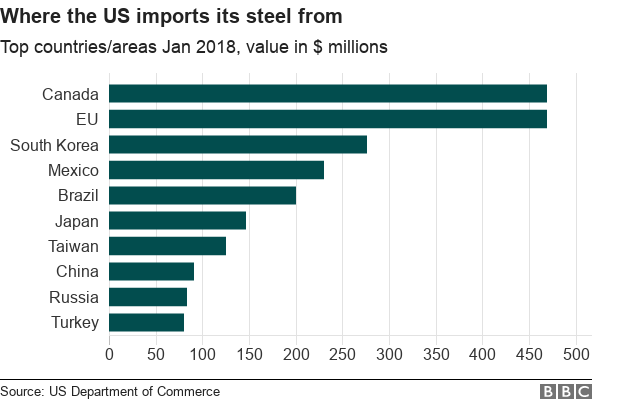 Mexico and Canada’s steel exports to the US account for 26% of all US steel imports while steel imports from the EU are considerably lower, but still not entirely insignificant by any means. To put further pressure on an already furious EU, Donald Trump has further threatened a ban on all German car imports which could have a devastating effect on Europe’s largest national economy, as well as a deeply negative effect on US consumer choice. Donald Trump’s long-standing promise to use import tariffs to try to revive the US steel and aluminum industry was opposed by US economists, labor experts, and even the industries themselves—but the White House did it anyway. As a result, over 146,000 Americans will lose their jobs, economists estimate. Tariffs might protect some jobs in the US steel industry, but far fewer than the number of jobs that will be lost. That’s because steel manufacturers in the US employ far fewer people than industries that make things out of imported steel, like automakers. Just over 400,000 people in the US work in metal-producing jobs, economist Jed Kolko wrote in March. Four and a half million work in jobs that depend on metal. Employers in the other industries are going to have to pay more for materials, making their products costlier and less competitive. This will force them to cut jobs, economists and industry officials say. Hurting US manufacturers even further, the countries hit by the tariffs will also tax imported US products. "That estimate assumed the US’s partners in the North Atlantic Free Trade Agreement, Mexico and Canada, would be exempted from the tariffs." Tom Donohue, president and CEO of the business organization, issued the forecast in a memo to the board of directors Thursday that was obtained by CNNMoney. The memo, citing outside studies, adds the possible job losses from tariffs both threatened and enacted by the administration, plus a possible US withdrawal from NAFTA, the trade agreement with Canada and Mexico. A NAFTA withdrawal would kill as many as 1.8 million American jobs in the first year, the memo warned. In addition, tariffs against China could cost 134,000 US jobs, steel and aluminum tariffs could cost 470,000 jobs, and tariffs on autos and auto parts could cost 157,000 jobs, Donohue warned. Ok, this is the part about Trump's trade policies that I find most objectionable. That we kick democratic allies in the teeth harder than we kick China. Allies that allow labor to organize, allow freedom of speech, and elect their leaders through democratic processes. To me, that is precisely the reverse of what we should be doing. We should cool it in regards to trade with China, while continuing to form and implement trade alliances with democratic countries that have relatively friendly labor policies. Trump hates organized labor. He also prefers alliances with people like Putin. Finally, he is a kleptocrat. One who embraces nationalistic rhetoric while selling democracy down the river to Putin. As for these statistics regarding job loss due to tarrifs. They remind me of an old saying: "There are lies, damn lies, and statistics". Of course retaliatory tarrifs by China are going to cost jobs in the U.S. How many jobs is guess work, at best. Moreover, protective tarrifs can have the affect of protecting and even creating jobs in the U.S. for those industries that are being protected. If the balance of trade with China is way out of whack, then the U.S. is well positioned to benefit from a trade war with China. Retaliatory tarrifs can only work to the point of resulting in zero trade. If the balance of trade is out of whack, then zero trade restores the balance. Somewhere in between zero and the current trade deficit is where we should try to end up. Where we should also end up is protecting American jobs from being exported to countries controlled by dictatorships that subject their workers to sweatshop conditions. Does China do that? Yes, and no. That is to say, it seems to vary from industry to industry and even business site to business site. So another approach might be "if you treat your workers well in the industry in question, we will have low tarrifs for that industry, if you let them get severely abused, high tarrifs will result." If we abandon any idea of pursuing such policies on the grounds that they are too utopian, then we might as well write off the idea of ever gaining back the White House or Congress. This so-called trade war that you all are afraid of is now being fought on Trumps terms, meaning that workers will be way down the list of beneficiaries. Yet, the appearance of a trade war will benefit Trump among those same workers. We complained that Hillary lost states like Pennsylvania, Wisconsin. Michigan and West Virginia. So why are we playing into Trump's hands with all of this "trade war" hysteria? Countries around the world fought back Friday against President Donald Trump’s decision to slap tariffs on steel and aluminum imports, announcing retaliatory countermeasures and warning that the U.S. plan will hurt U.S. consumers. Germany’s Volkswagen, Europe’s largest automaker, warned that the decision could start a trade war that no side would win. The European Union and China said they will deepen ties on trade and investment as a result. “This is stupid. It’s counterproductive,” former British trade minister Francis Maude told the BBC. President Donald Trump's metal tariffs on U.S. allies are actually a "gift" to China, according to one Obama-era trade representative. "The world was aligned with the United States in recognizing China's threat around steel and aluminum," Robert Holleyman, a former deputy U.S. trade representative, told CNBC's "Squawk Box" on Friday. "We've now turned our ally Canada into a potential ally of China on these issues. It's nonsense, it's costly, it'll hurt exporters." The Trump administration decided Thursday to impose tariffs of 25 percent on steel imports and 10 percent on aluminum imports from Canada, Mexico and the European Union. The tariffs against Canada and Mexico come as the United States has been trying to renegotiate the 1994 North American Free Trade Agreement with its partners north and south of the border. Trump has repeatedly said if a better deal can't be crafted he would pull the U.S. out. I suppose domestic steel production will need to pick up to meet the difference? Donald Trump has slapped 25% tariffs on British steel, in a fresh blow to already struggling UK producers. The White House announced this afternoon that it was dropping the EU from the exemption on global tariffs of 25% on imported steel and 10% on aluminium. The exemption is due to expire tomorrow. The move is likely to spark a trade war which would be devastating to the UK’s already fragile steel manufacturing industry. It comes as new figures reveal some 34,000 people are employed manufacturing steel in the UK, with the highest concentrations in already deprived areas in Wales and the North of England. Trump is destroying all of our friendships. This is something Russia would want as that strengthens only Russia. Not so long ago, U.S. leaders predicted that economic development and the birth of a middle class in China would inevitably move that nation toward democracy. Instead, China’s leadership has profited from a weaker West. It has seized on opportunities created by European fragmentation and political dysfunction in Washington to offer China as an alternative model of stability and development. Another mistake by the U.S.: lawmakers doubted that China would ever become technologically innovative. They believed that, like the Soviet Union, China’s state-dominated economic system would hit a wall when it came to developing new ideas. Instead, China learned from Soviet mistakes. At first, the state allegedly helped Chinese companies steal ideas that couldn’t be developed at home. But now China is investing huge sums in the artificial intelligence, robotics and data-management innovations that will determine tomorrow’s balance of power. China’s President Xi Jinping declared in October that the nation must become a technological superpower. He has repeatedly emphasized the need to shed dependence on foreign intellectual property. “Indigenous innovation” and technological self-reliance are now core to China’s development strategy. His Made in China 2025 program, backed with huge state subsidies for its tech sector, is central to Xi’s vision. On May 29, President Trump launched an offensive against that plan. To protect its national security, the White House said in a statement, the U.S. will restrict investment in and control exports of “industrially significant technology.” The Trump Administration proposes to slap 25% tariffs on some $50 billion of Chinese tech imports, including those related to the vaunted Made in China 2025 program. In essence, the battle for the future has been joined.